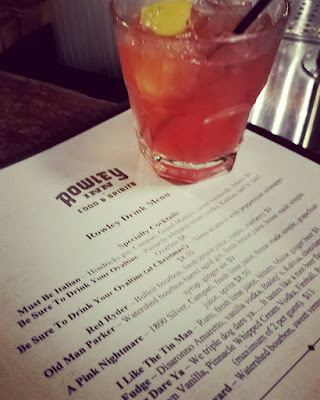 The Rowley Inn is a laid back bar with great food that happens to be located across the street from The Christmas Story House. It's the perfect stop after a tour, but you'll definitely want to visit all year long. The Rowley Inn has been around since 1906. 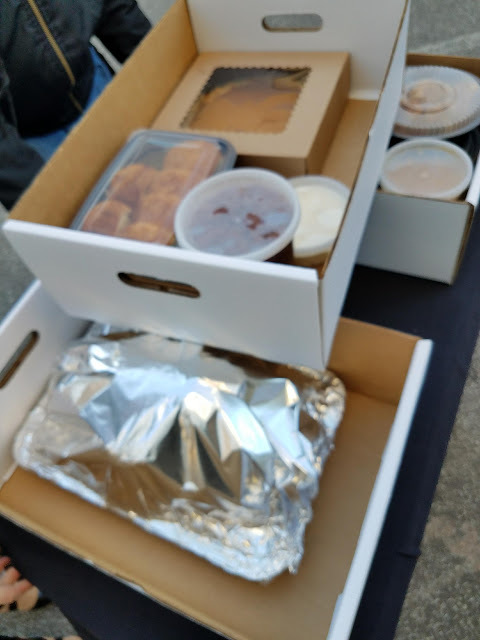 They catered to people in the neighborhood including steel mill workers that worked nearby. About a year ago, it was purchased by Jon Oberman and Raphael Rivilla. 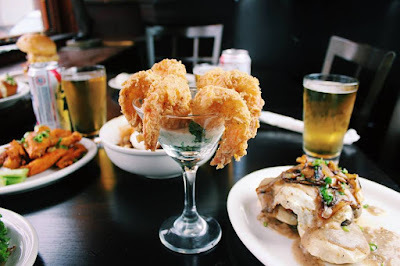 They have worked hard to keep the history of The Rowley intact, while transforming it into a dining destination for Cleveland style comfort food. It looks like a typical dive bar from the outside and I honestly rarely gave it a second glance. But thankfully they invited a bunch of Cleveland bloggers in for a complimentary menu tasting because the Rowley Inn was a tasty surprise! We started with the fantastic Red Ryder cocktail made of course - with Bulleit Bourbon. "You'll shoot your eye out!" They took the term menu tasting VERY seriously, and while we were left wishing for stretchy pants and doggie bags, we all agreed that we wanted to come back again, even before finishing our meals. I told you we ate a lot! 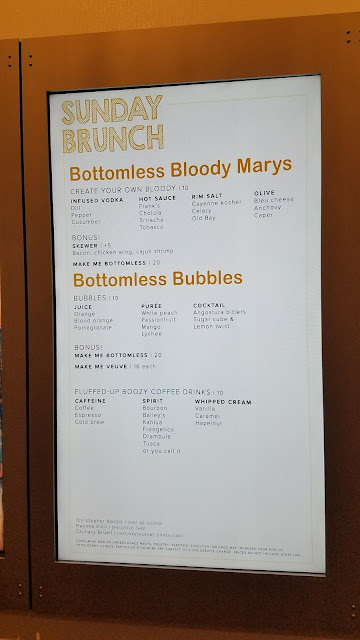 My favorites were the Shrimp Cocktail, Southwest Chicken Salad, Cleveland burger and Mac 'n Cheese. The Candied Apple Pierogies would have been amazing if only they were served hot and with a dollop of whipped cream or even ice cream. 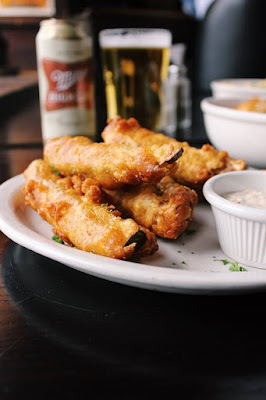 In addition to their regular menu, they also have daily specials and a great Happy Hour (Monday through Friday 3-6pm) that includes a $6 cheeseburger and 1/2 off select apps. Did I mention $2 draft beers too? You can follow them on Facebook and Instagram. When I heard that Cleveland was getting a new Hilton Hotel downtown, I knew it was going to be something special. With gorgeous lake views and an ultra convenient location right next to the Convention Center, it was sure to be a spot tourists flocked to. But the Hilton definitely isn't just a place for tourists thanks to the very unhotel-like The Burham Restaurant located inside. 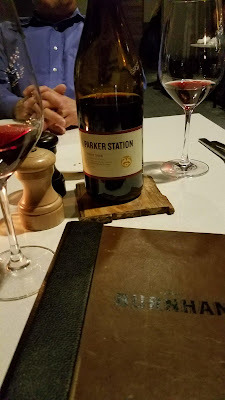 I was invited to dine and dish about my experience by the awesome folks at The Burnham. They provided the food, and we purchased the booze. As always, all thoughts and opinions are my own. 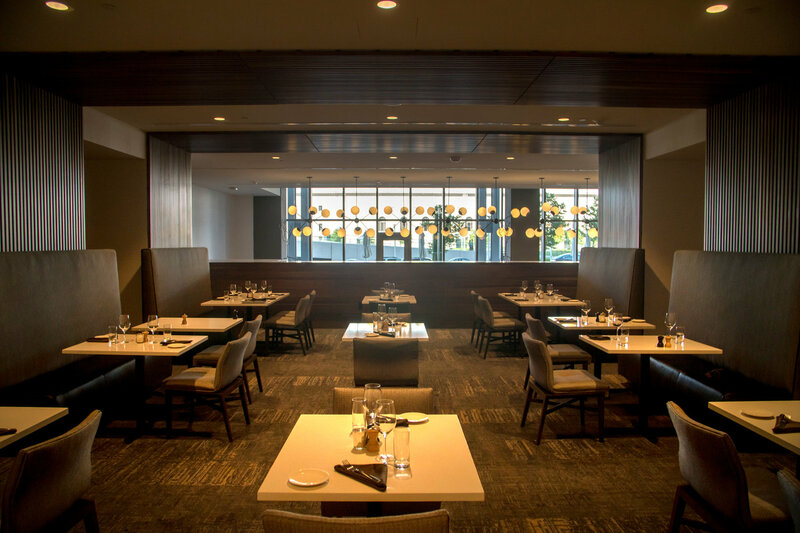 The Burnham Restaurant is modern yet cozy thanks to the muted earth tones and beautiful wood details thoughout. 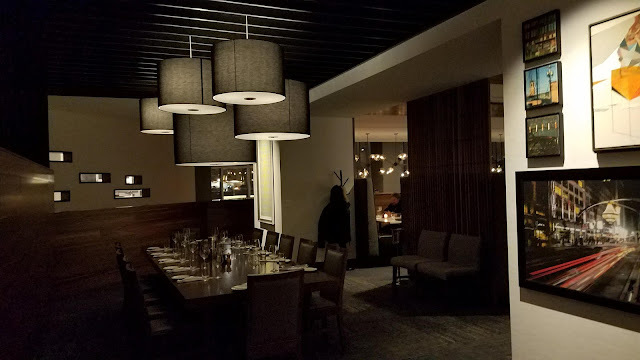 Inside the restaurant, there are several distinct areas - the large party seating area shown above, the kitchen level dining room that lets you see the kitchen in action and a lower bar level that offers a wall of windows that opens up to the patio. We especially loved all of the art featuring Cleveland and created by local artists. 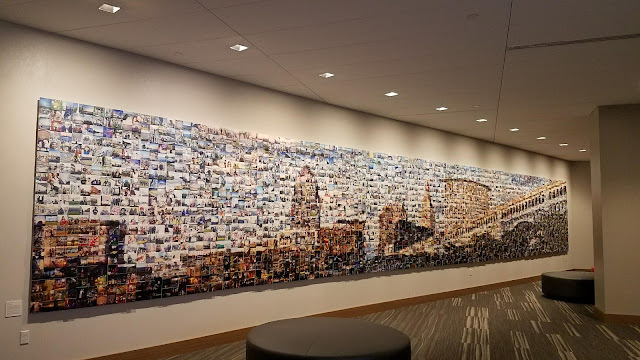 Be sure to head to the lower level of the hotel by the walkway to the Convention Center - this Cleveland skyline mural was created with Instagram photos and you just might spot someone you know in it. I found my step-sister, her hubby and a bunch of friends! We kicked off the meal with a bottle of wine. They had many affordable choices by the glass and bottle, plus some splurge worthy bottle only selections too. 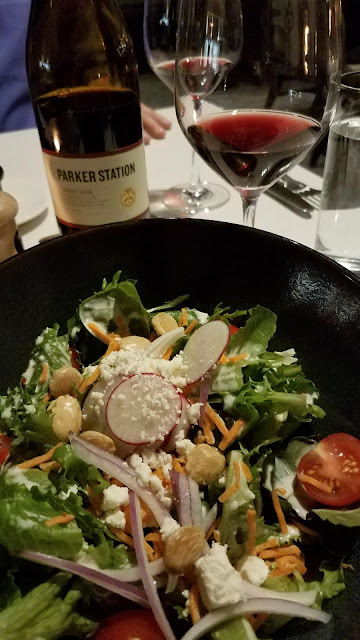 One of the benefits of ordering a bottle that is served by the glass is that they will let you sample before buying so you can make sure you order the perfect pairing for your meal. The menu has something for everyone and had so many tasty sounded dishes, it was hard to choose what to order. This is one of those places where I wanted to create a meal out of the appetizers, small plates and salads. Next time! 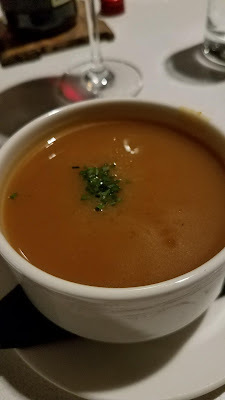 While I was extremely tempted by the Lobster Bisque, I opted for the Roasted Butternut Squash Veloute with wild mushrooms and truffle oil. The best part were the roasted mushrooms hiding in the bottom of the cup. I will definitely be copying this trick at home! It was generous but the perfect size for a starter. A tiniest dollop of creaminess on top would have made this even dreamier. 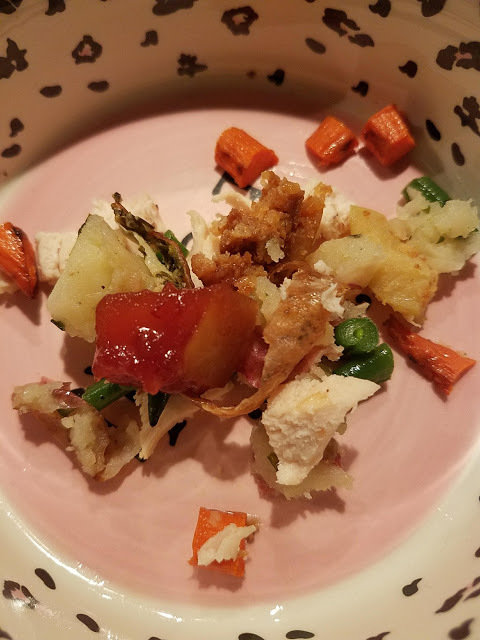 In an effort to save room for dessert, my husband and I split a Mixed Greens salad. We especially enjoyed the addition of the marcona almonds. The size was perfect for sharing. 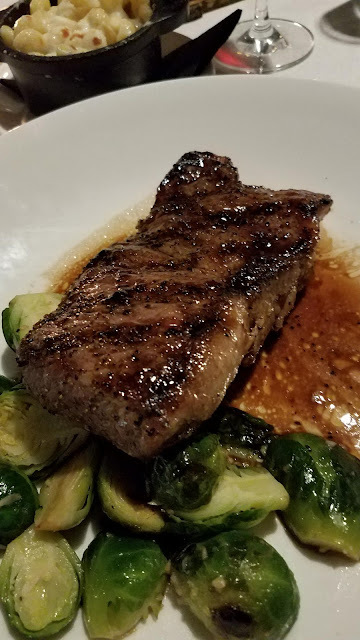 I couldn't resist the Steak of the Day - a perfectly prepared CAB strip steak from a local cow broken down by the chef, served with white cheddar mac 'n cheese and roasted brussels sprouts. It was excellent and I was happy to have enough for a hearty lunch the next day too. 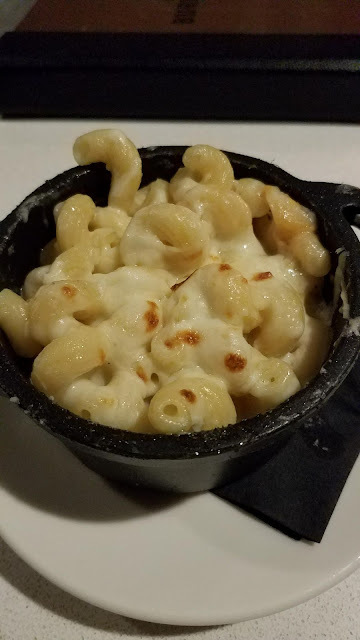 I loved how the mac 'n cheese was served in a tiny cast iron crock - besides being adorable, it kept the pasta hot and gooey. My husband ordered my second choice - Roasted Ohio Chicken. This was a boneless half chicken, Gruyére dumplings, spicy Cleveland Kraut, Thumbelina carrots and Hungarian paprika jus. 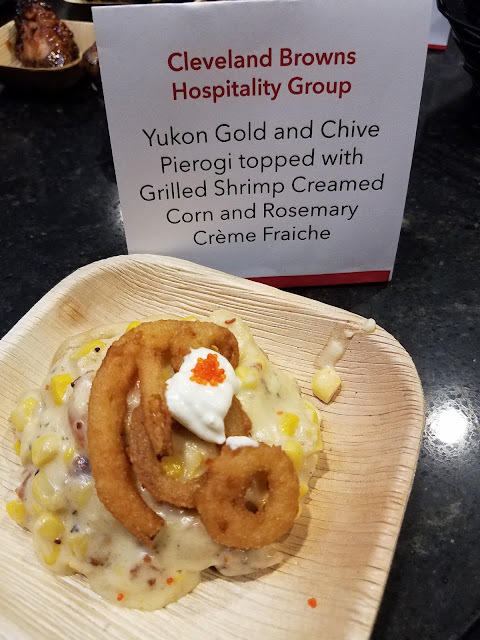 This was a unique and delicious twist on chicken paprikash. I am still thinking of those dumplings. Before we had arrived I knew dessert was a must. 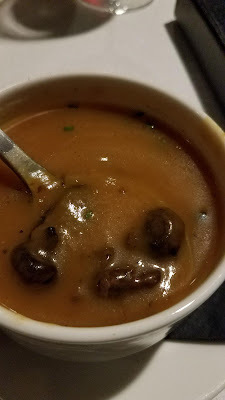 The menu had many delicious sounding choices and I had seen some tantalizing Instagram posts. 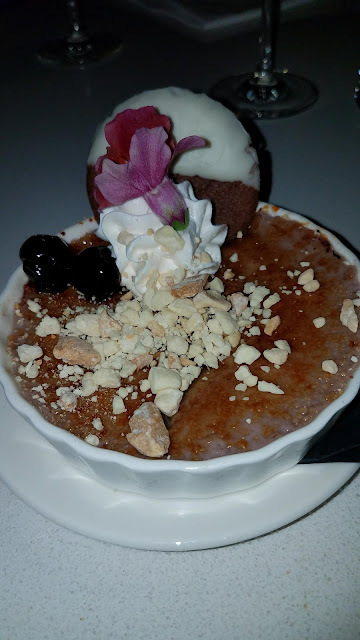 While the Sweet Potato Cheesecake and Spiced Caramel Pumpkin Tart were extremely tempting, I finally decided on the Cherry Creme Brulee with sauteed cherries. 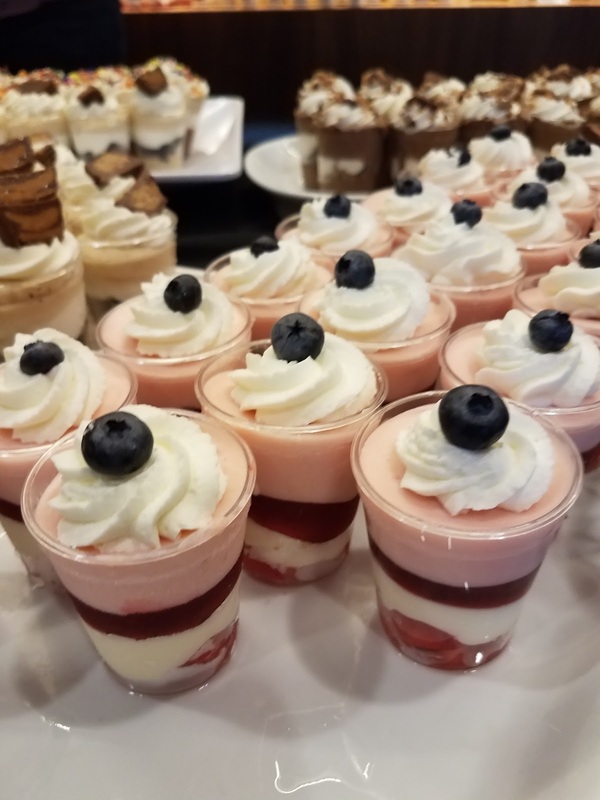 I loved that they took a traditional dessert and really kicked it up a notch. And it was seriously gorgeous too. We were going to head up to Bar 32 while we were there but we picked the cloudest and rainest evening imaginable. It's another excuse to head back! We also definitely want to go back and try their brunch. With tator tot waffles, blueberry and chia seed pancakes, a quinoa bowl, chicken and dumplings, a $20 bottomless Bloody Mary bar and more, how can you resist?? It's the perfect place for a pre-Browns game feast thanks to it's location. 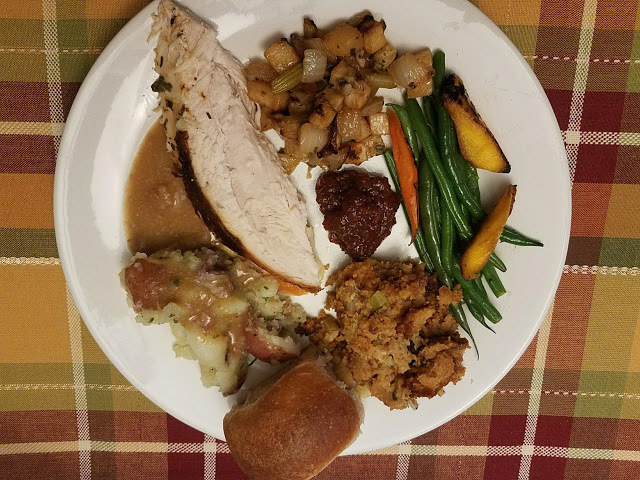 During the holiday season, they are offering Christmas to Go: your choice of either ham or turkey with delicious sides (chutney, salad, green beans, potatoes and mac 'n cheese to be exact) and either chocolate silk or pumkin pie. All you do is pick it up and go. Serves 6 for $125/$145 depending on the meat chosen. Call 216-413-5096 and order by Dec. 19th. Thank you to The Burnham and Mouthwater Media for a wonderful evening! Did you know, CLEseats is a website and mobile app that serves up daily specials and exclusive deals at some of the best restaurants throughout NE Ohio. If you haven't already, check them out too! Are you sick of trying to figure out what to make for dinner all the time? I know I sure am! While I LOVE to cook, I get tired of trying to figure out what to make. Inspired by the NY Times "What to Cook This Week," I'm starting a new feature to help us all come up with practical ideas and inspiration to make dinner more fun and less stressful. These recipes will be realistic, palate pleasing and hopefully help make dinner fun again. I don't cook at home every night and I'm sure you don't either. I'll focus on 3 great recipes so you can still work in your favorite recipes, use up any leftovers and go out to eat too. If you have a favorite recipe you would like me to feature, let me know! 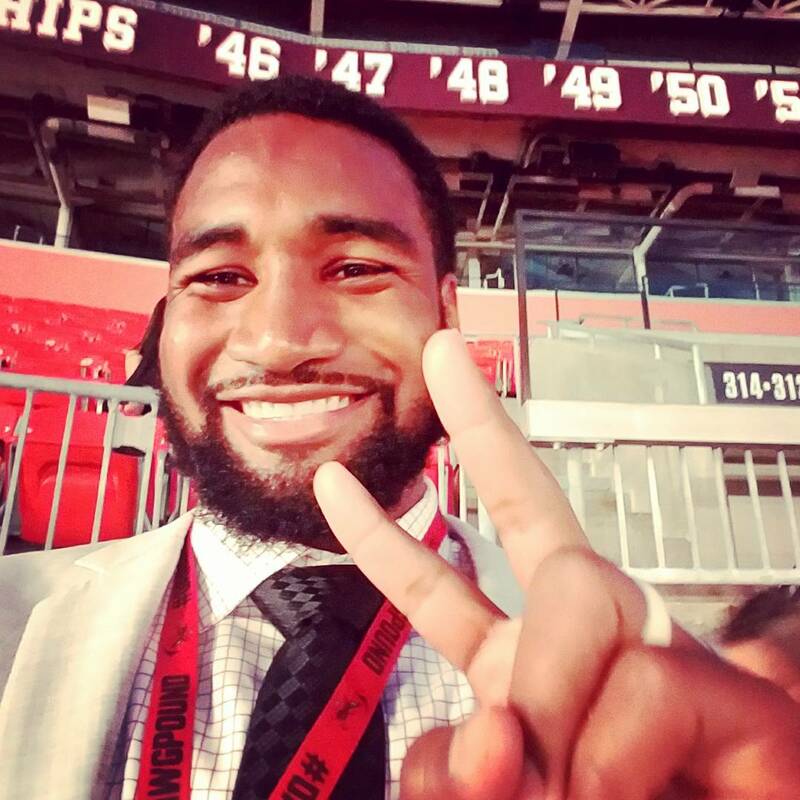 The blogging community in Cleveland is booming. While many of the old timers have hung up their keyboards, there is an enthusiastic and talented wave of new bloggers on the scene showing us that blogging is thankfully not dead. Leah of By Travel and Error has made it her mission to get us local bloggers together to meet each other in real life for fun, networking and education. It's a more local version of the Ohio Bloggers Association. And she is doing a GREAT job! We're three meetups in, and it's been a blast! 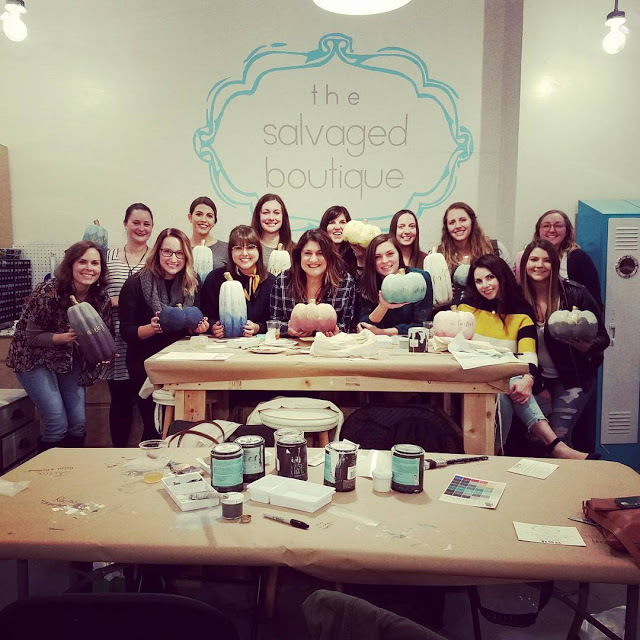 Last night a group of ladies went to The Salvaged Boutique for a crafty night of fun. While I have stalked this shop online for ages, this was my first time visiting. Kathy and Karen are the super sweet owners, sisters and most gracious hostesses. The Salvaged Boutique is a shop and studio featuring refurbished furniture, vintage good, up-cycled items and unique home decor - basically all the beautiful things. In addition, they offer make and take workshops to let out your inner artist. Our group made Ombré painted pumpkins. 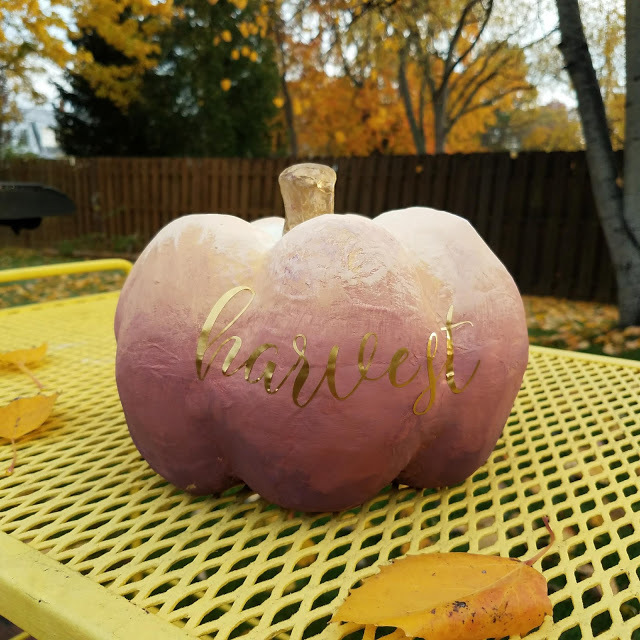 We painted paper maché pumpkins with Wise Owl chalk paint, gilded the stem and applied gold vinyl fall themed words. While we were working on our beauteous masterpieces, we sipped tasty cocktails provided by Watershed Distillery. This Ohio-based company is one of my favorites. We had a build your own Old Fashioned bar featuring their pre-made Old Fashioned. This is great for a party because you don't have to measure and mix and the cocktail is perfect every time. 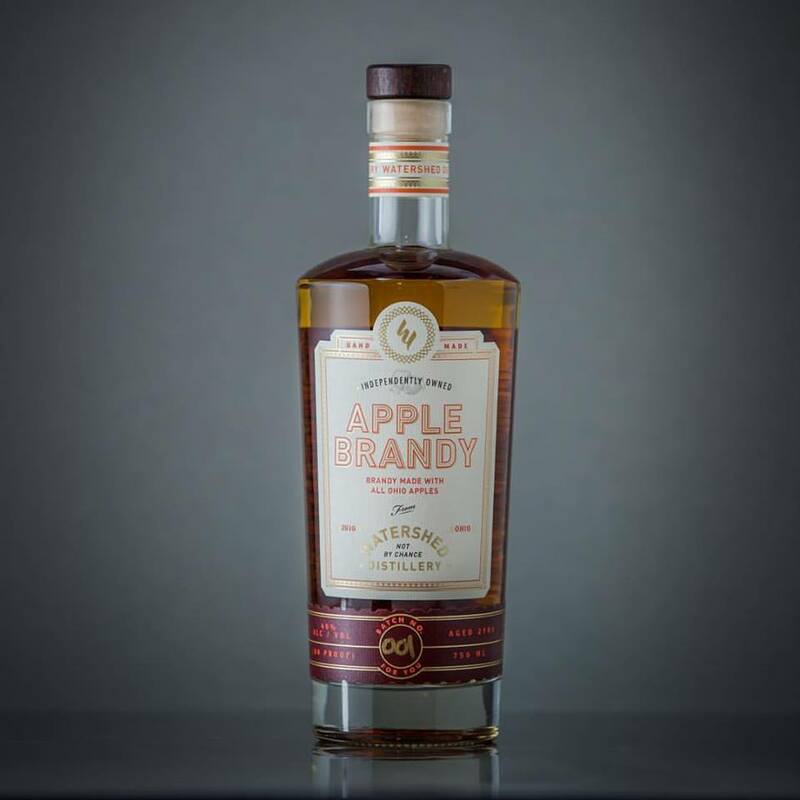 We also got to try the newly released Apple Brandy that is made with 100% Ohio apples. 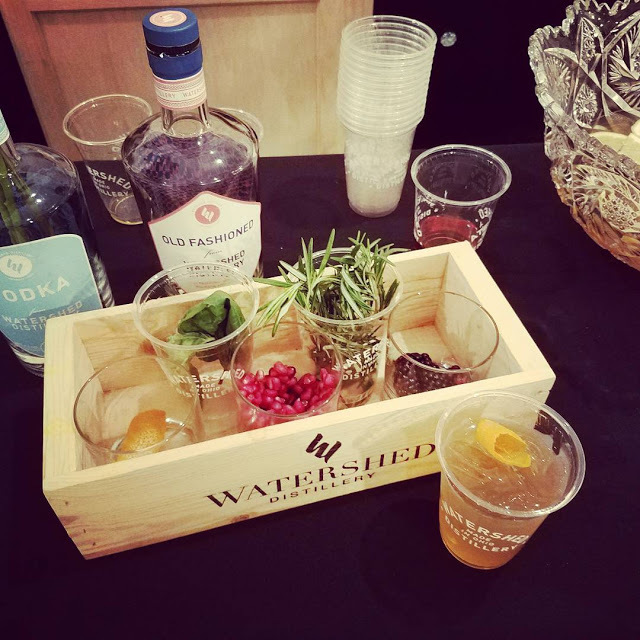 Jen from Watershed made a giant punchbowl-sized cocktail by combining it with lemon juice, maple syrup, and sparkling cider. This was dangerously easy to drink and would be perfect for Thanksgiving. We also received a swag bag filled with some chocolates, greeting cards by Plum City Designs and beauty samples from Stella & Shay Beauty Bar. It's always nice to find out local businesses. #ShopLocal people! Thank you to The Salvaged Boutique, Watershed Distillery, Stella & Shay Beauty Bar and Plum City Designs for helping make this a night to remember. So first I have to say, that Thanksgiving is my favorite meal. The one I look forward to all year. I just can't get enough turkey and especially all the delicious sides. So as soon as the calendar flips to November, I start my countdown. 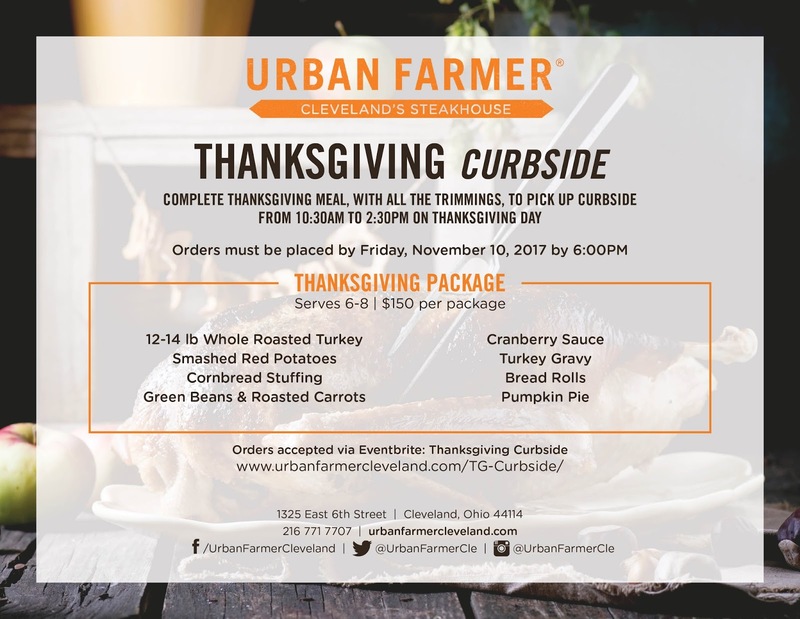 This year I got a sneak peak of Turkey Day when Urban Farmer invited me to try out their Thanksgiving Curbside program. Here's how it works - they prepare the entire meal with ALL the sides and all you have to is stop by and pick it all up. That's it! No shopping. No cooking. And minimal cleanup. You get to spend more time enjoying the holiday, visiting with family or friends, or making your Black Friday shopping list instead! The only thing you have to worry about is placing your order by 6pm on Friday November 10th. When I pulled up, I was greeted by these two lovely ladies pushing a cart with a huge amount of food on it. Pro tip: Make sure you have room in your car for everything. There's a lot of food! As you can see, the packaging was excellent. There were two large containers each of the potatoes, stuffing and veggies and one big tall container each of the gravy and cranberry sauce. The boxes are VERY sturdy and have handles so transporting everything was a breeze. Nothing tipped or spilled or got squished. If your timing is right, you can just dig in when you get home. We weren't going to be eating for awhile and I wanted to keep everything hot so I transferred the sides into oven-safe containers and put them in the oven. You could easily microwave everything too but it was cold outside and I was very happy to turn on the oven. Do you see the pan the turkey is in in the photo above? That is a real pan and comes with the meal - a very nice unexpected bonus! Everything was excellent especially the turkey (it was actually juicy! ), cornbread stuffing, and the roasted veggies. The rolls and butter were pretty amazing too. The flaked sea salt on top really showed the attention to detail that goes into everything that they do at Urban Farmer. My Mom and Step-Dad joined us for dinner and there were TONS of leftovers. I only served half of the sides provided and we didn't come close to finishing everything. They say that this meal serves 6-8 but I would say it serves 8 easy and you would still have leftovers. 1. 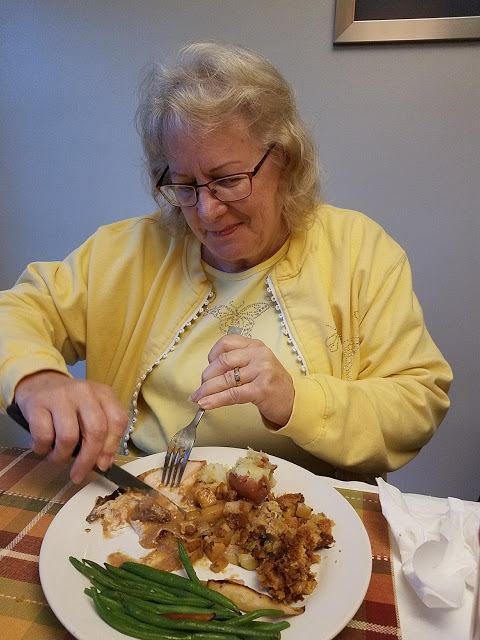 My Mom actually ate turkey...and liked it. She NEVER makes it or eats it, so this is big news! 2. I fell in love with cranberry sauce. I never even touch the traditional stuff but I couldn't stop eating this one. More of a compote, it is very fresh tasting and has chunks of fruit in it. I've been enjoying it with the leftover butter on bread - way better than typical jam, that's for sure. 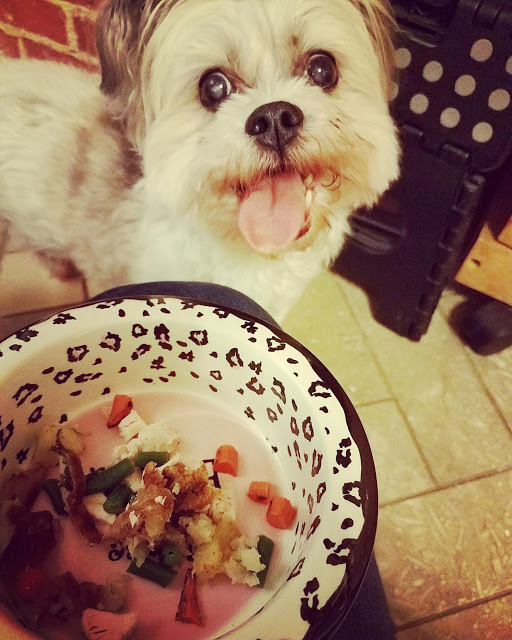 She even had her very own bowl of yum. She ate all this and was still begging for more. She even had some pumpkin pie. Buffy gave the Urban Farmer Thanksgiving Curbside feast two paws up and we all agreed. 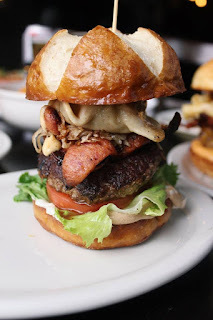 While the food may not be the EXACT menu that you are used to, you will not be disappointed. Remember, professional chefs are making the meal. For example, we always do a traditional bread stuffing but loved this cornbread version. There were no complaints and it was a nice change of pace to try new versions of old favorites. If you are like me, the best part about Thanksgiving is the leftovers. So even if you celebrate with family, this Curbside meal is the perfect way to ensure lots of tasty leftovers. And it's obviously PERFECT for a Friendsgiving too! We made lots of sandwiches, a pot pie and some of the best turkey soup I've ever made! 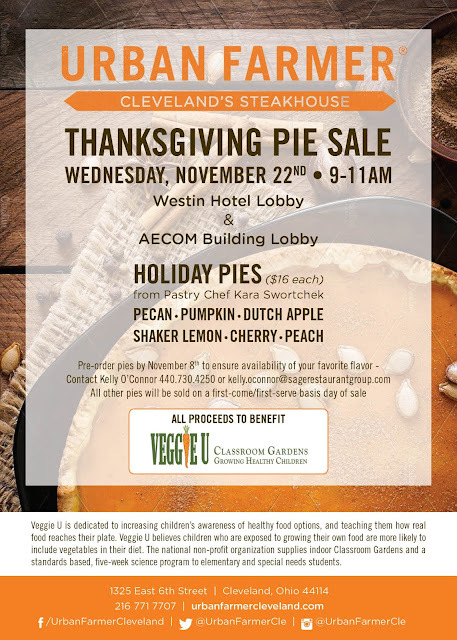 In addition to the Curbside dinner, Urban Farmer also has a Thanksgiving Pie Sale. Of course pumpkin is available but also some non-traditional choices that sound amazing. Shaker Lemon - I'm talking to you! Pick up is on Wednesday November 22nd from 9-11am. Orders must be in by November 8th. Call 440-730-4250 to reserve yours. 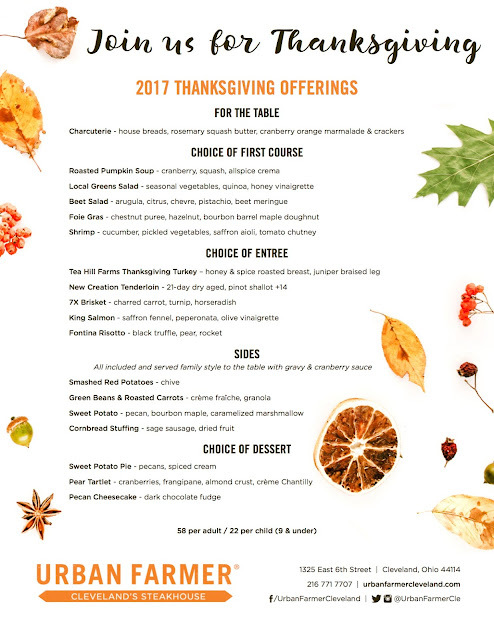 If going out on the holidays is more your style, they will be serving a Thanksgiving feast in house too. 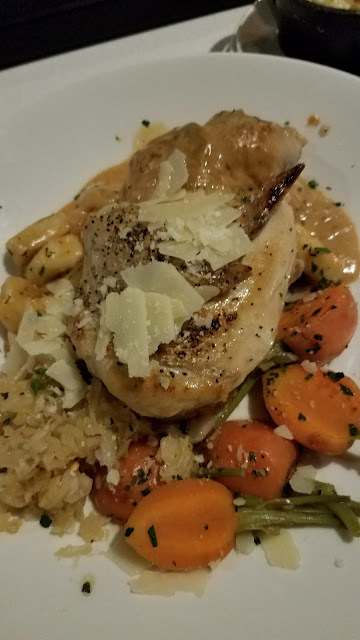 This is great if you don't want turkey because they also offer lots of choices including beef tenderloin and a fontina risotto with black truffles. Yum. $58 per adult/$22 per child 9 and under. Before trying the Curbside dinner, I would never have dreamed of not having a family cooked meal, but this definitely made a believer out of me. 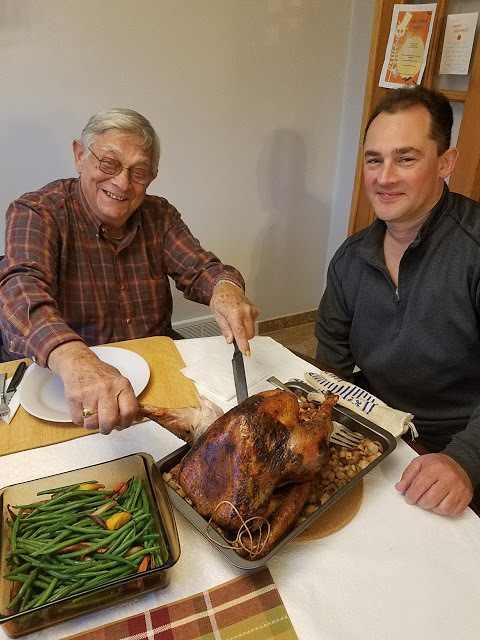 Would it be too crazy for us to have THREE Thanksgiving dinners?? I'm tempted to order another one! 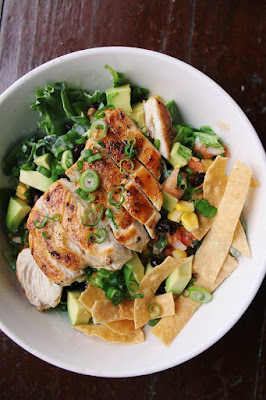 Thank you to Bahama Breeze for partnering with me on this post! What is Rumtoberfest? It's an annual celebration of all things rum at Bahama Breeze. Now through November 5th, you can join in the fun. 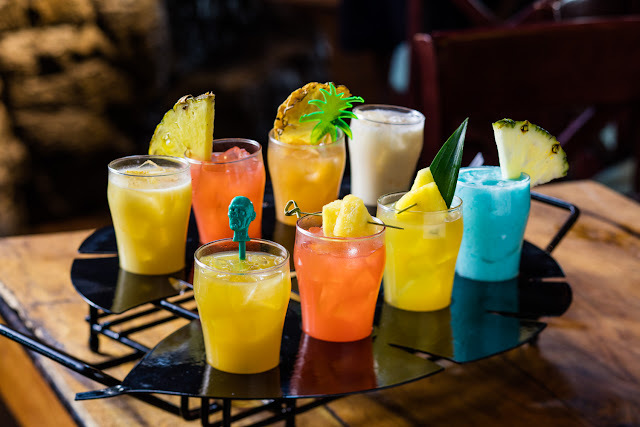 They unveiled three brand-new signature rum cocktails for the event – Shipwrecked, Tradewinds and Frozen Mojito. This year’s Rumtoberfest also introduces the restaurant’s largest rum flight, the Rum Raid – featuring eight rum-based cocktails for parties of two or more to conquer. This was so much fun and a great way to try all the tropical cocktails! I really enjoyed the Tradewinds and would love to go back and try that Frozen Mojito since it isn't included in the Rum Raid. If you prefer your rum straight, try the Premium Rum Flight: Zaya Gran Reserva, Barbencourt 15 Year and Estate Reserve Mount Gay XO. In addition to the cocktails, there are two rum based food items: Rum & Coke Ribs and Chicken and Rum Cake. Man, I wish I had room to taste the rum cake! You can follow Bahama Breeze on Facebook, Instagram and Twitter. Providence House is Ohio’s first and one of the nation's longest operating crisis nurseries. They offer free, voluntary (non-custodial) emergency shelter to children ages newborn through ten years old who are actively living in crisis situations. Providence House works with the families to help prevent abuse and reduce foster care placements. They provide individualized parent education, mentoring, counseling, certified trauma specialists and therapy to keep families together. Their program really works - last year 98% of the children were reunited with their parent or guardian! You can help them continue their amazing work by attending their 5th annual fundraiser pARTy with PHriends on Friday September 29th. There will be lots of tasty bites, wine and beer, a DJ and more. Plus you'll have the chance to purchase artwork created by the children and win raffle baskets. You can purchase tickets online for $35 each - it includes 5 beer/wine samples and one full sized beverage of your choice. 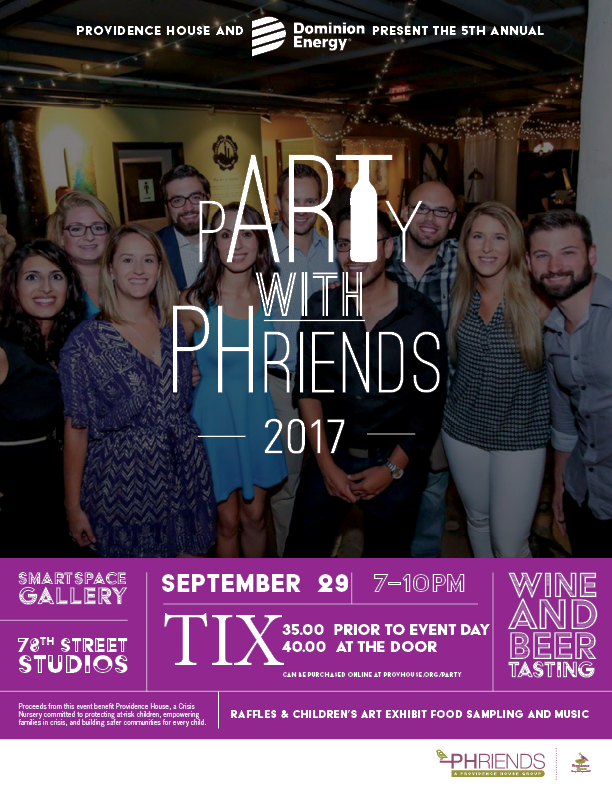 I'm also giving away a pair of tickets to pARTy with PHriends! Enter using the Rafflecopter below. You can also head over to Instagram for another chance. Winners will be drawn on Thursday. Good luck! 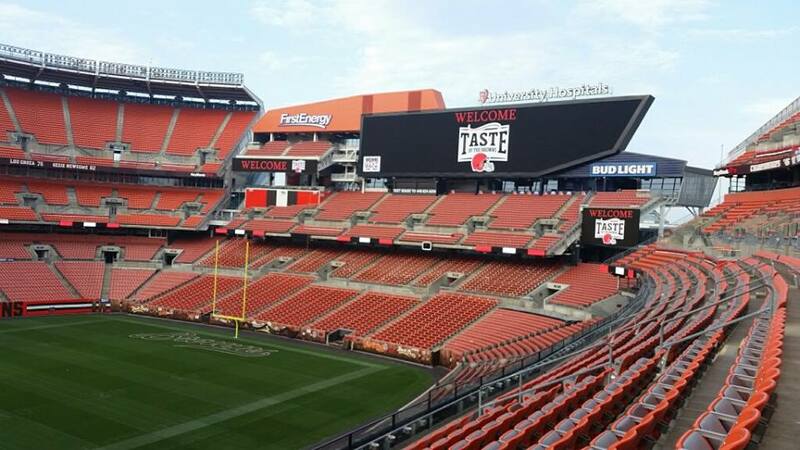 Until the Browns win the Super Bowl, the Taste of the Browns is the most fun you'll ever have at First Energy Stadium. We may love cheering on the Browns during home football games, but this event has an extra element of fun. Great food for an even greater cause. This annual fundraiser for the Greater Cleveland Food Bank is one of the best ways to help tackle hunger. What makes it so great? 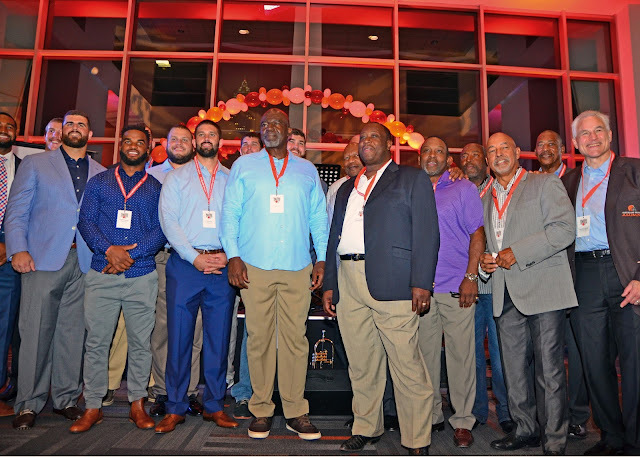 This is THE place to mix and mingle with some of your favorite Browns players, past and present. They are big guys with even bigger hearts. Plus they are super gracious and are willing to take a million photos and even sign autographs. They offer a ton really cool items that will have you whipping out your wallet in record time. You get the opportunity to win amazing and unique experiences and collectables. With over 25 vendors, you really have to pace yourself. 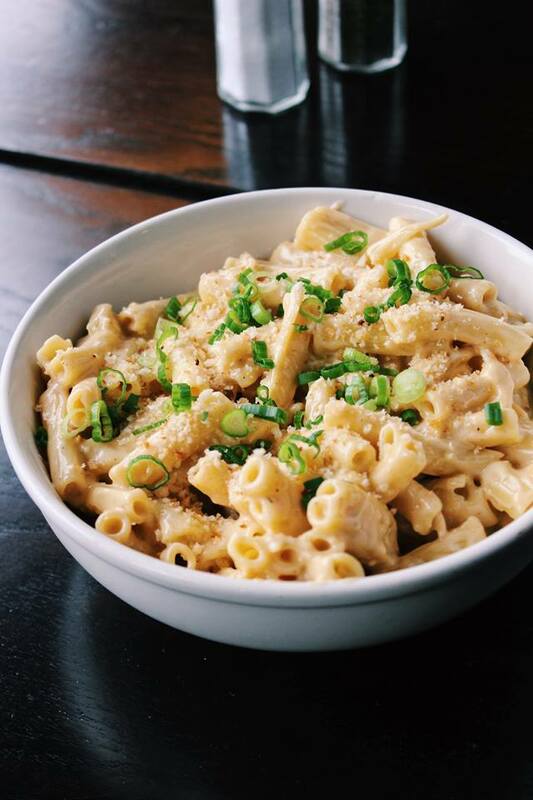 There are so many delicious dishes it's always hard to pick a favorite. 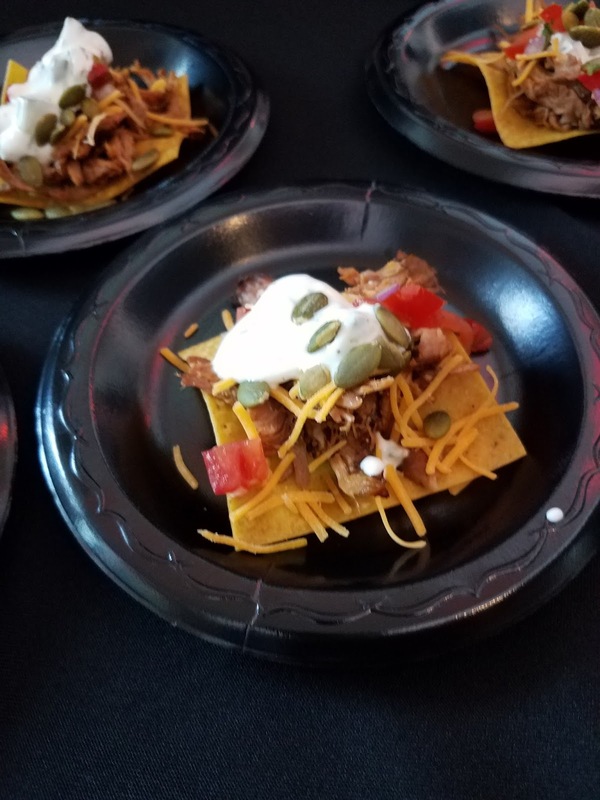 This year, my favorite bites were the Buffalo Chicken Taco from Barrio and the luscious chocolate cups of heaven from Chef John Selick of University Hospitals. For some of the bigger dishes like sliders, it makes sense to share with a friend if you want to try everything. An extra shout out goes to the chefs who served food that was easy to eat in addition to being delicious. The event offers you the chance to be able to experience the Club Level which is quite a treat. Plus you get to sit outside in the seats and enjoy the beauty of the stadium when it's quiet. This year the weather was PERFECT too. I didn't want the night to end. And the absolute best part = the event raised $255,000!!! 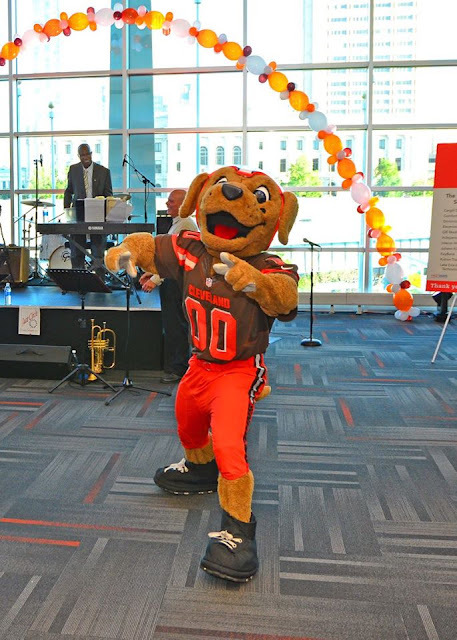 As usual, the Greater Cleveland Food Bank scored a touchdown with this event! Definitely mark your calendars for their 20th anniversary next year. In the meantime, you can donate, volunteer or even give via shopping by using Amazon Smile. Follow them on Facebook, Twitter and Instagram. Fall is fundraiser season and I am extremely excited to attend one that I have never been to before. L'Amour du Vin features wines from around the world and cuisine from delicious Cleveland area restaurants. In addition, there will be exciting raffles, a unique silent auction and exclusive VIP Lounge with specialty cocktails. All proceeds benefit the Arthritis Foundation’s mission to conquer and cure arthritis. 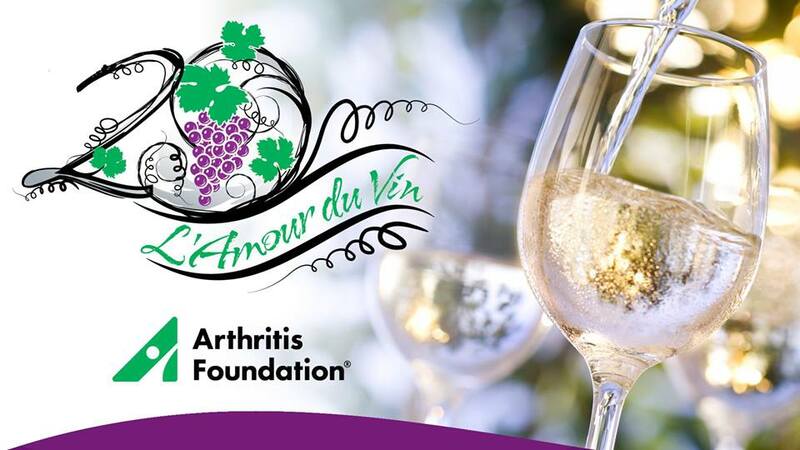 This annual fundraiser for the Arthritis Foundation is celebrating their 20th year! And thanks to their generosity, you can win a pair of tickets and join in the fun. Tickets are on sale now online. If you upgrade to The VIP experience, you'll also get delicious tastings from Bonefish Grill, high-end wines from Heidelberg Distributing Company, specialty cocktails from Brown-Forman and chair massages compliments of EXHALE: The Spa. I don't know about you, but a massage and some win sound like heaven! Guests will enjoy these great restaurants and wine, and get the chance to bid on auction items. If you are feeling lucky and would like to win a pair of tickets, enter using the Rafflecopter below. Contest end Saturday Sept. 23rd. Good luck! Find out more at the event on Facebook. Everybody in Cleveland eagerly awaits fall for many reasons. One of the biggest is the return of football! My first love is baseball but there is something about football season that is just plain FUN. Maybe it's the tailgating. Or maybe it's one of the most highly anticipated events of the year, Taste of the Browns. 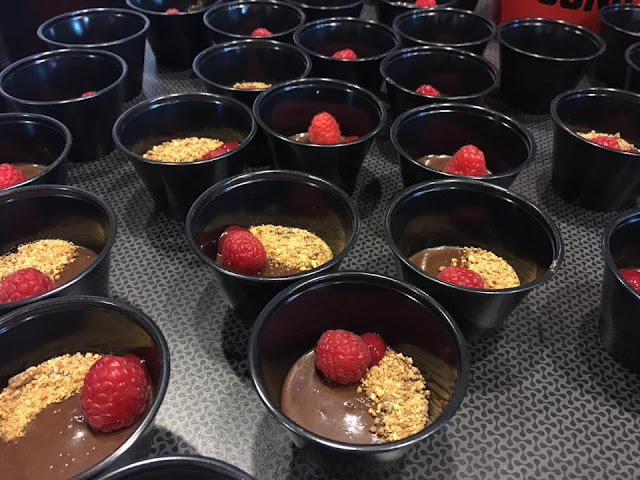 Last year they raised more than $226,000 and distributed more than 904,000 meals! 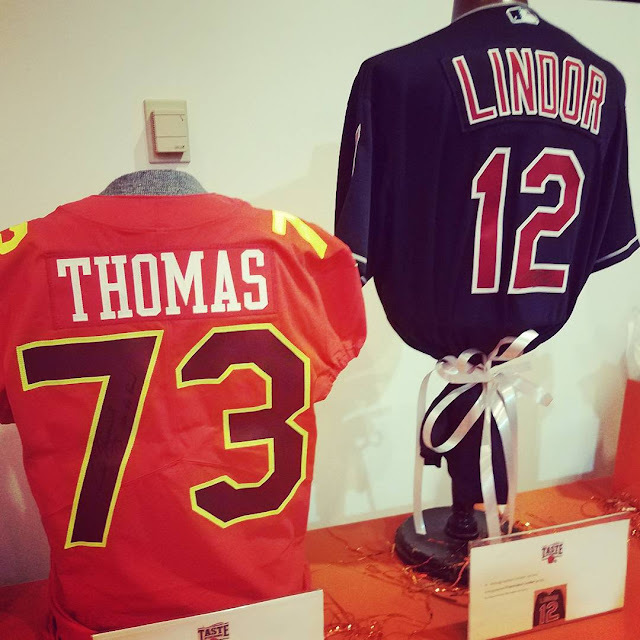 This annual fundraiser for the Greater Cleveland Food Bank is packed with amazing food, great auction items (like Joe Thomas' Favorite Things package, chef tastings, and a Terminal Tower party! 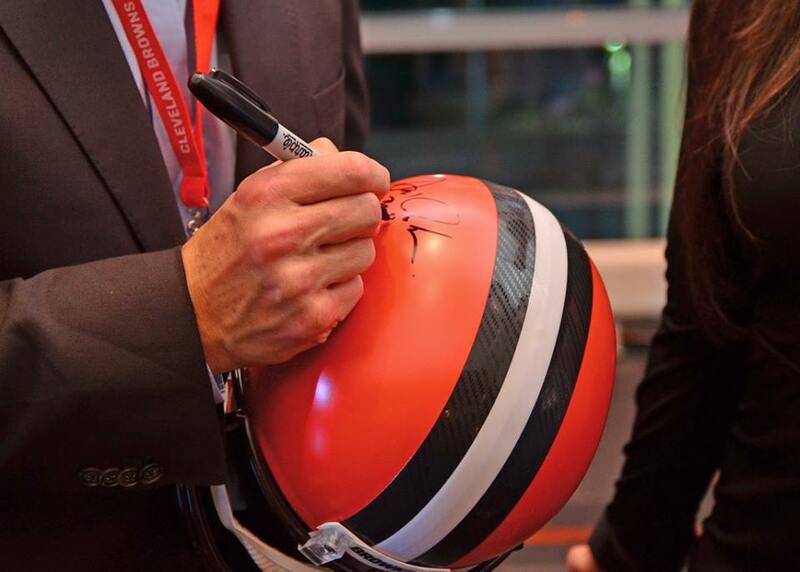 ), tasty beverages and best of all, Cleveland Browns football players both past and present. 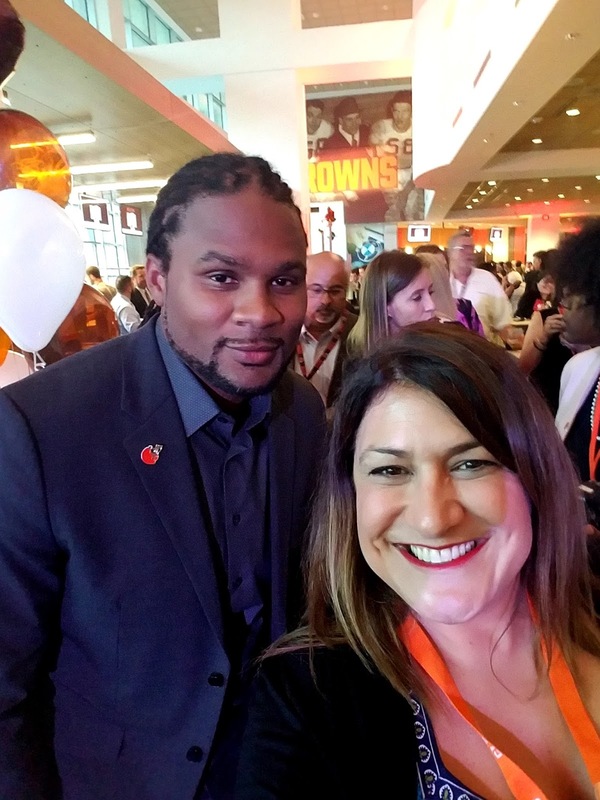 You'll be able to mingle with Joe Thomas, Josh Cribbs and other Browns favorites with nibbling and sipping in the Club Lounge at First Energy Stadium. The list of participating restaurants is long, but some of the ones I'm most excited about are Amp150, Blue Point, Edwins, Lago, Luca and Humble Wine Bar. When you purchase a ticket to Taste of the Browns, you help ensure that everyone in our community has the nutritious food they need every day. The Greater Cleveland Food Bank is a wonderful organization that not only helps the hungry in our area, but also reaches out to people hit hardest by natural disasters such as Hurricanes Harvey and Irma. For every dollar donated, they are able to provide four meals! Think of all the people you can help feed by attending this event. Even if you can't attend you can help tackle hunger by bidding on items or making a donation. You can also try to get lucky and win tickets here! I have two general admission tickets to give away to one lucky reader! Complete any or all of the entries using the Rafflecopter below. 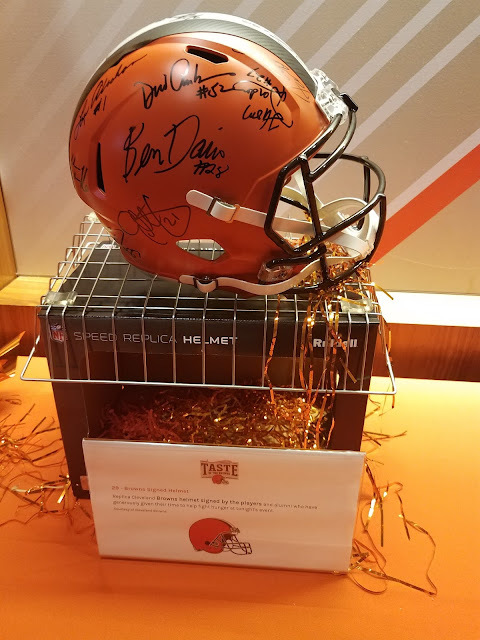 You can also head over to Instagram for another chance to win (look for the Taste of the Browns logo). Winner will be chosen randomly on Thursday at noon. 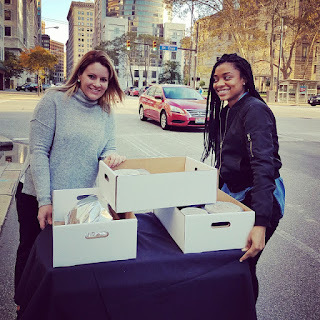 You can follow The Greater Cleveland Food Bank on Facebook, Twitter or Instagram.